The antibody is a mouse monoclonal antibody against recombinant Human Leptin Receptor. The Human Leptin Receptor is a recombinant protein produced in mouse myeloma cell line. DNA sequence including the extracellular domain of Leptin Receptor (amino acid residues 1 839) fused to the Fc region of human IgG (with IIEGR added at the amino terminus and 6 histidine residues added at the carboxy terminus). Leptin receptor (OB R) was identified as a leptin binding protein (Leptin, the product of the ob gene, is a single chain 16 kDa protein consisting of 146 amino acid residues.) OB R was found to be a member of the class I cytokine receptor family with a large extracellular domain comprising 816 amino acid residues. Leptin receptor exists in multiple forms with a common extracellular domain and a variable length cytoplasmatic portion. Alternate splicing from a single gene derives the six isoforms of the Leptin receptor. The soluble form of the Leptin receptor, OB R contains no intracellular motifs or transmembrane residues, thus it consists entirely of the extracellular ligand binding domain of the receptor. Long forms of OB-R transcripts were reported to be expressed predominantly in regions of the hypothalamus which provides evidence that Leptin receptor is important in body weight regulation. Expression of short forms of OB-R transcripts have been found in multiple tissues, including the choroid plexus, lung, kidney, and primitive hematopoietic cell populations. Leptin receptor may act as a negative regulator of Leptin activity and it may maintain a pool of available bioactive Leptin by binding and delaying its clearance from circulation. Soluble Leptin receptor levels are indirectly proportional to adiposity and are increased in females versus males. Leptin receptor levels are highest in infants, decrease into adolescence, and remain relatively stable throughout adulthood. 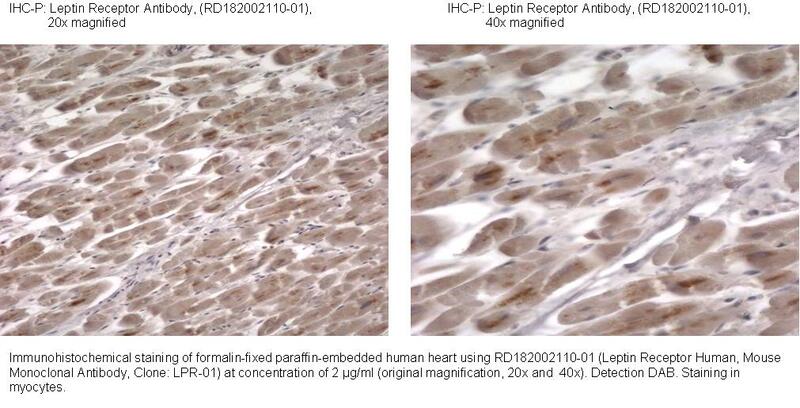 Soluble Leptin receptor is also found upregulated in patients with chronic heart failure, end-stage renal disease and anorexia.